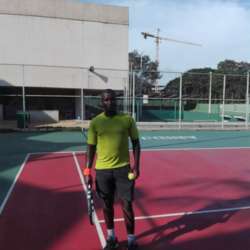 You must be a member of the Abidjan Let's Play Tennis Group to attend this activity. Would you like to join this group? For those who are tennis fans, I wanted to inform you that I found tennis courts and a co ach to make us hit the ball at the Protected content , every Tuesday from 19h to 20h00. These tennis lessons are open to all members of InterNations up to 6 people per session. We will have two tennis courts at our disposal and a coach to give us the basics and allow us to make matches together at the end of each session. You just need to come in tennis gear and sports shoes, not forgetting your racket. Possibly you can rent a racket on site. Next Tennis lessons are scheduled on Tuesday 29th January Protected content 19h. 1 / Register on InterNations community group "Let's Play Tennis". 3 / Specify if you will need a racket : cost of rent is 2.000 XOF/racket. The cost of renting the pitch, balls and fees for the coach are included in the price of 13.000 XOF (CFA) per participant. For further information you can contact me on Protected content .